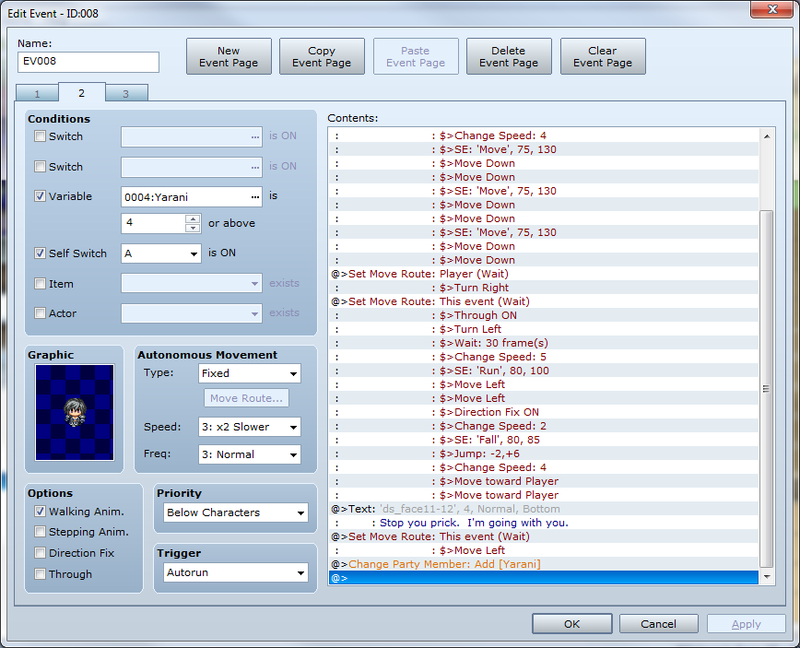 By Kirin, March 28, 2012 in Completed Scripts/Plugins/etc. Well, I can release a early version of the script if you want. But it does not nearly feature as many extras as I want the full version to have. But the 4 tile thing is already implemented (plus a bunch of others). Have you filled all the tiles correctly and did not miss one? Have you also placed an obstacle in the second layer in the obstacle tile? Because when the engine tries to copy that obstacle, and there is none, it throws an error. Have you created events? Also monsters and stairs? Because, when i remember right - the old version throws an error when it tries to place an event but there is none. These two points are especially important when creating a new map. Also when you copy a map, sometimes the tiles get messed up. An easy solution is to quickly re-draw the map tiles by hand (ground, wall, ceiling, obstacle) by painting the ground layer first and then add a empty (transparent) tile to the second layer (except for the obstacle which must have a obstacle graphic in the second layer). Thats just two points i stumbled across quite often while dealing with the script. Feel free to ask if you need more help! Thanks you for your advices ! I just missed something when I set up the wall tiles, something about forgot to hold shift I guess. I'll try first KillZapit's version and then your's when you'll release it Thanks you two for the work you've done ! Hehe, thanks to my autotile updater script you don't need to hold shift when placing tiles in mine, but that shouldn't have caused a crash anyway, just make the tiles look funny. Your Demo is amazing. Seems to work really really well. Are we free to use it of course crediting you and the original author? Anything we should be aware of? Works really really well. Also this the first time looking into these kind of procedurally generated dungeons. How does one finish it? How does one exit? Yours seems to have a really cool forever lasting level system. When it says enter a level does that mean how many to make or where you start? Well, really the only thing my demo does in increse a floor varible, and the stair event check the floor number varible and decide what to do from there. The only tricky thing is I have to jump to another map and back to get it to update properly. So it only really makes one floor at a time. The bad thing about my demo is, I don't think it's very easy to paste the scripts in new projects, expecialy since I use a whole lot of common events and stuff too! I even have some terrian tags set up on he tile sets... There are lots and lots of features in their own scripts, and I devided the old Dungeon Generation into 3 or 4 scripts on it's own. It would probobly be much less work to modify and add and delete scripts from my demo then try and navigate my maze of script interdependency. I really should make it more plug in based or something. Same here: My script is so uber-complicated with variables, interweaved-events and script modifications that its almost impossible to port it. But Im thinking along the lines of KilloZapit here: Maybe we can create a portable *new* script for random dungeons someday in the future! With your skills that would be a great idea. Then some of the problems with Saba Khan's would disappear and make the world a better place. Yes! No more old wacky problems! Here to a whole NEW slew of wacky problems At least I have the advantage of actualy understanding how BSP-Tree dungeon generation works... it's actualy pretty common and well documented ways of doing it. This script has a few odd quirks about it that I have semi-fixed like the way it only seems to split each rect once in each dimention. I made it split more, but then I hadd to write code to correctly match up some cupples because it dosn't keep info about each itteration of the tree and just splits it and adds a connection at each split... which can cause problem if you split the rects again because the cupples are no longer lined up.I think most BSP-Tree generation keeps each generation and transverses the tree backward making a connection for each sub node, which may end up with fewer paths over all. I am sure there is probobly a better way of doing it that dosn't involve either keeping the full try or my kinda hackish molre brute force conectivity searching. BTW, if you have no idea what BSP-tree dungeon generation is, look here. Also: my script has some cellular automata support for caves, but I am not sure my brith and death numbers are the currect way to discribe cellular automata rules. BTW: All the stuff Sophien requested is doable right now with the script as it is. Its just a matter of clever eventing. You have to add forks to the events you place on a dungeon floor to check if the enemy will appear or not. This is actually true to all Maker games: Most of the functionality can be done by using a core script and then expanding it with clever use of events, forks, variables and switches. I keep getting an error even though the room i'm going in isn't a dungeon. is there a fix? Could be another script, need a more detailed description of that error please! I got an error on line 699 : NoMethodError occured. I'm getting the dark_edge2 cannot be found error. It doesn't seem to change, even after re-downloading the files and swapping them. I even downloaded the demo and copied the file out of it, but I still have the error that won't let the game start. Did you put it in the right spot? Sorry for not replying earlier, but yes I did. I even put it into multiple different places just in case, but it still won't work. Thank you. I have a working version of it. I will give you a demo of it and maybe that will help. Would that be to your liking? I ended up getting a fix, but found a whole new error with an event on a separate map with this script loaded. If anyone has any idea where I'm going wrong, I would appreciate the help. I have a couple questions if you have the time to answer that would be very helpful. The first is there a way to move the position of the mini map? I've tried to find where it defines the position but I can't seem to notice it so I am unsure how to make it move out of the dead center of the screen. Is there a way to make the walls more then 1 block high? I have things I'd like to have on the walls and it'd be great if I could get the walls taller then 1 tile at a time. Is there a way to specifically put events on the walls? Because I have a set or rooms I need the players to enter and it keeps wanting to put the door in the middle of the floor... I can always go through and change the sprite so it looks like a wall tile behind it, but I was hoping there's simply a note or something I can add that changes that. Is there a way to lock the floors into one configuration? Say you enter the dungeon and you get one lay out. But then you go into a room off of that map you and you come back to that floor it's a completely fresh dungeon... I was wondering if there's a way to lock each floor into the first patter it generates? Also is there a reason that I'm not seeing that this script doesn't play well with this one? I can use his hud, but I can't use his over world battling or over world animations. I know part of it is that to randomly generate enemies this script requires a " in the name of the enemy events, and his script requires a <> scripted name in each enemy event... I've got a question in to him on this as well but I would like to use both of your scripts instead of having to hunt for a different one for either of your scripts that plays better with one another. Script 'Dungeon Creation' line 686: NoMethodError occurred. I first copied the scripts from this topic but kept getting 1 error after another. So I ended up coping the scripts right out of the demo and I got the above error. Any ideas how to fix? It dumbfounds me that the demo WORKS, yet after ripping the scripts from it I STILL can't get this to work. I'll go ahead and link my project so you can hopefully see where the problem is exactly. It's just testing, nowhere near a started project. EDIT:Are you serious? I found the error that was crashing my game. It wasn't a problem with the script, I needed to use a tile from "map B", basically page 2 of the map editor. I can't even understand why that was causing problems but oh well. I got it fixed after copying my own map into the demo and via versa.